Christmas is one of my favorite times of year, and it is hands down my favorite holiday to decorate for. This year since the girls are a bit older I decided to decorate their play area a bit! I added this cute paper bag advent calendar from the Creative Co-Op. I bought it last year but didn't have a chance to hang it up - #momfail! I can't find the exact one, but linked the current version which is under $15 (affiliate links used in this post)! I hung it from basic command hook and covered the hook with a faux wreath from Michaels! I am planning on filling them wtih a small piece of candy and The Happy Home Fairy's Advent Bible Verses! I also added a small boxwood wreath with a command hook to their kitchen. I loved making their play area more festive and they love it too! I wanted to share a product that I received from a company called Get Qurious! Their sweet owner reached out to me after seeing posts of us on Instagram and asked if she could send their Explorer Box to us to try! 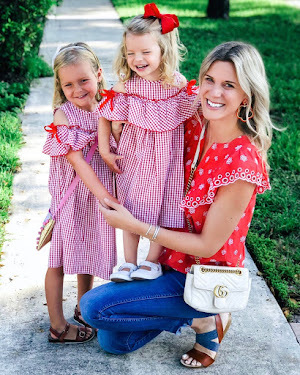 I jumped at the chance because I love finding new, educational and exciting toys for my girls to use. Avery loves anything related to the iPad but I try to limit how long she uses it to ensure she is getting varied types of play. 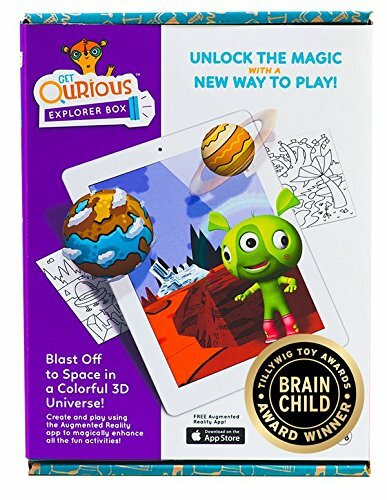 Well this Explorer Box uses the iPad to hone in on several skills such as fine motor, whole brain thinking and creative/imaginative play! The box comes with cards and masks to use interactively with an app that you will have to download (free) onto your iPhone or iPad. It requires iOS Version 10 or higher. The concept of the story is that the main character Manu and his friends are coming to life via the app/game and are going out into outer space! There are several activities that can be done via the Explorer Box including building a story, building a space ship, playing with included masks and a treasure hunt. Avery's favorite was building a story! This product is an affordable and unique twist on your classic iPad experience. If you are interested in purchasing this, I would say that your child should at least be 4. Charlotte had fun watching, but would be too young at this point. I also think Avery will grow with this toy as she becomes more independent with the iPad! You can purchase it from Amazon here, and it ships free with Prime! Yay! As stated above, I received this product c/o, but all thoughts and opinions are my own!